Held in February during the Tucson Bead and Gem Shows, the retreat offers more than 80 classes over an eight-day period that range from metalsmithing to art jewelry classes. 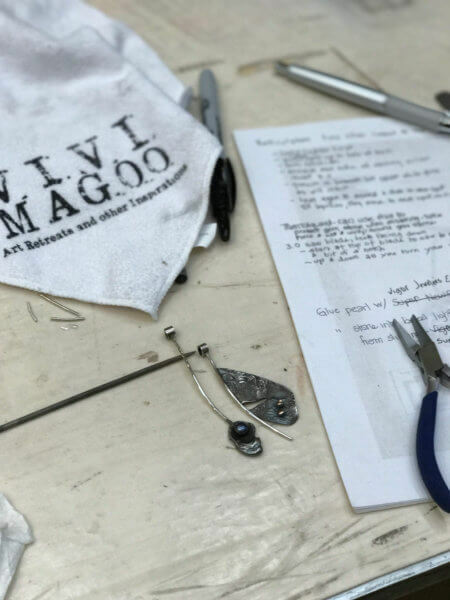 And in true Vivi Magoo style, we bring in the best artist-instructors that provide excellent teaching in combination with a welcoming, inspirational setting. Instructors are working on their classes now! Don’t miss out on all your favorite classes! Vivi Magoo has a block of rooms reserved for this event. Breakfast included as well as hosted happy hour, close to the action…all in a beautifully renovated hotel. Want to see what fun our students had in 2019? Because instructors need time to gather materials for kits and plan for their classes, we have thoughtfully created the following deadlines for our retreats. Prior to November 12, 2018, there will not be any processing fees to switch classes. From November 12, 2018 through December 16, 2018, switching classes will incur a $25 per six-hour class processing fee. On or after December 17, 2018, switching classes is not permitted out of consideration for our instructors. Prior to December 17, 2018, there will be a $70 per six-hour class processing fee to cancel classes. On or after December 17, 2018, all fees are non-refundable. Great news! We listened to your feedback and revamped the registration fee on our website. It is no longer a separate fee that needs to be added during checkout. Adding classes or editing your schedule? No hassle! Please contact Erin at erin@vivimagoo.com with any questions or concerns. Where is the retreat held, and how do I get there? Art Retreat in the Desert is held in Tucson, Arizona at the Hilton Tucson East. With stunning views of the Catalina Mountains and only minutes from Tucson International Airport, the hotel is the perfect setting for the retreat. From TIA take Tucson Blvd out of the airport to Valencia. Turn right (east) onto Valencia and drive approximately 5 miles until you reach Kolb. Turn left (north) on to Kolb and drive approximately 5 miles to Broadway Blvd. Turn right (east) on Broadway Blvd. Hotel is located on the right (south) side of the road at the corner of Broadway Blvd and Prudence. You may choose to ship your things ahead of time to Tucson. Here is the address for the Hilton. Make sure to put your name on your boxes so we know where to direct them when they are delivered. We would appreciate it if you would time delivery one day prior to the start of your first class. We offer an a la carte menu of classes and outings. You can register for just one class or as many as you’d like. Our classes range in length from 3-hours to several days. Each is priced accordingly. Classes range from beginner/novice to advanced/professional. Each class description will state the skill level necessary to complete the project. Classes are small enough in size (no more than twenty students/instructor) so each student will be able to receive a bit of personal instruction. We are always available by email to discuss particular classes with you.